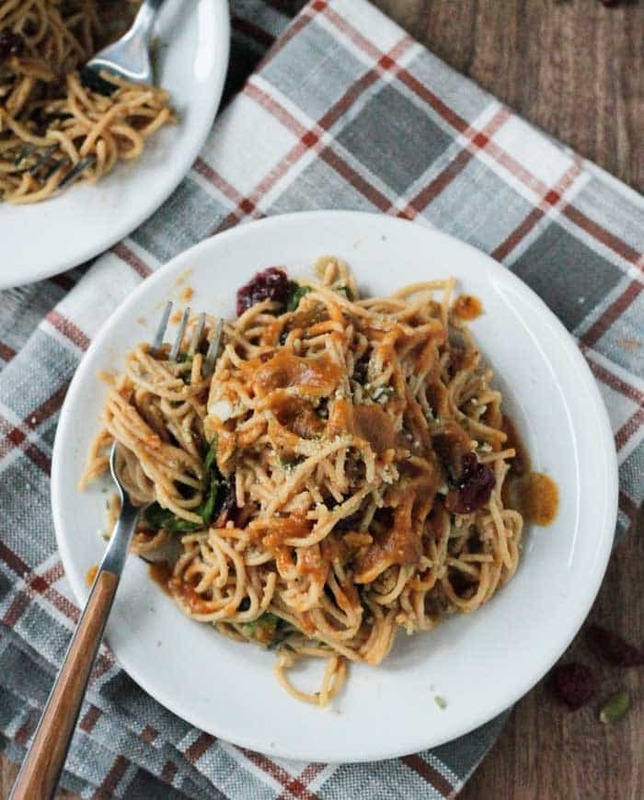 Spaghetti with Spinach and Cranberries in a Creamy Maple Pumpkin Glaze is the perfect fall pasta dish. It might sound complicated, but it comes together quickly and easily. The whole family loves this! Pasta is my go-to weeknight meal when we are in a rush or when I don’t know what else to cook. Mainly because I know it’s something the kids will always eat. Usually it’s a simple marinara or my Lentil Bolognese (made with leftover lentils that we always have on hand). But, every so often I change it up a bit and add some fun flavors. 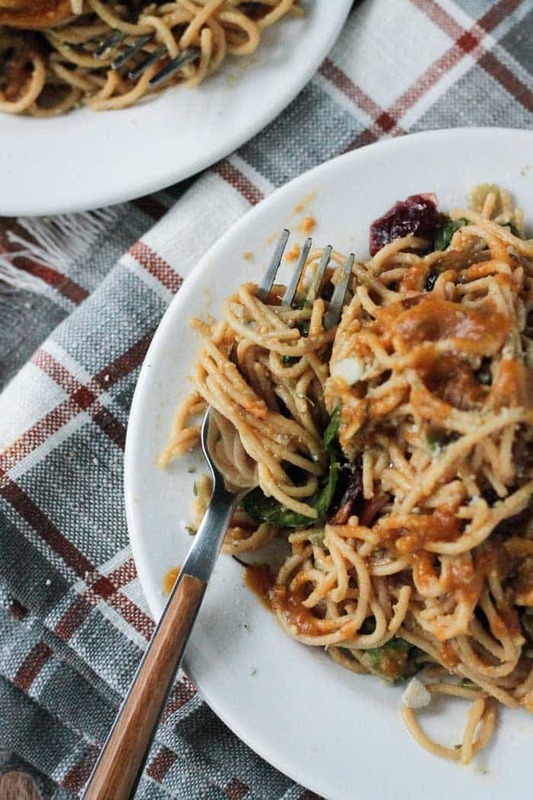 This Spaghetti with Spinach and Cranberries is such a great seasonal dish. And it’s the perfect way to sneak in some veggies if your kids are picky about that. Not only is there spinach and cranberries, but there’s also pumpkin in the sauce. Hello, vitamin A! 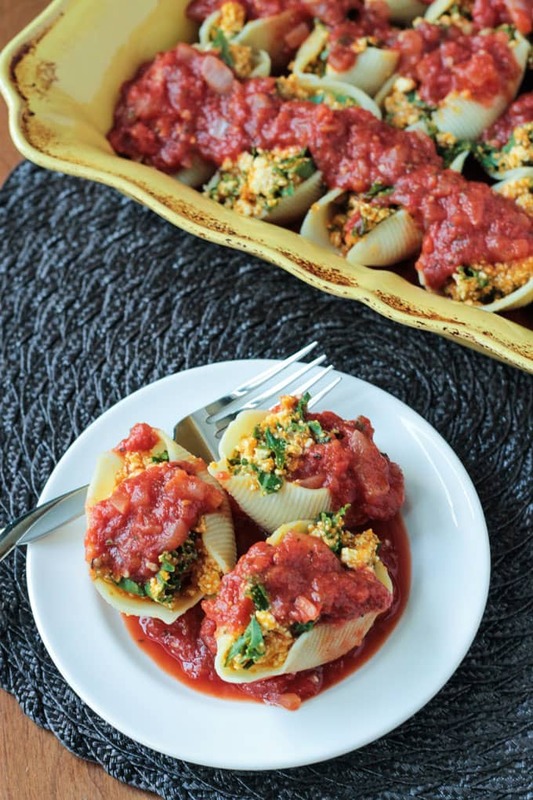 Give your pasta a fall make-over and try this recipe today! I’ve tweaked the sauce to make it richer and creamier, adding some protein and sneaking in some extra veg along the way. 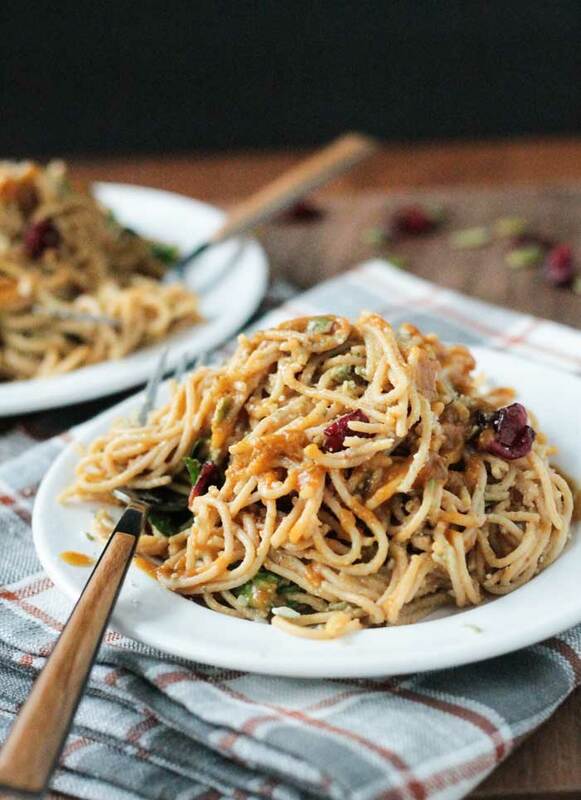 This Spaghetti with Spinach & Cranberries is a winner and would be the perfect addition to any plant based holiday table. 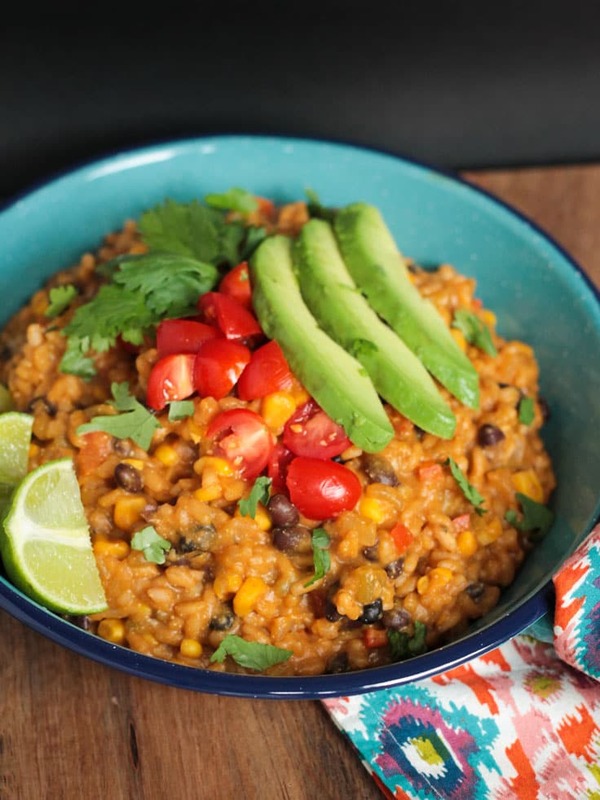 However, it cooks up in such little time, that it’s also a perfect dish to whip up any busy weeknight. Bonus – the kids love this too! I hope you guys love this autumn spaghetti recipe as much as we do. Please leave me a comment below with your feedback and star rating after you try it – I love hearing from you guys! You can also find me on social media. Let’s see those remakes! Be sure to tag me @veggie_inspired and #veggieinspired so I’m sure to see it. aghetti with Spinach and Cranberries in a Creamy Maple Pumpkin Glaze is the perfect fall pasta dish. It might sound complicated, but it comes together quickly and easily. The whole family loves this! Meanwhile, make the glaze. Whisk all glaze ingredients in a small bowl until smooth and set aside. Alternately, you can combine all glaze ingredients in a blender for a few seconds. Pulse the pepitas in a food processor or blender a few times (or chop finely by hand) and set aside. When spaghetti is done, turn off heat, drain and place back in the hot pot. Add spinach and cranberries and mix a few times. The heat from the pot and the noodles will sufficiently wilt the spinach and soften the dried cranberries. Pour glaze over the spaghetti, spinach and cranberries and mix well. Toss in the pepitas and mix well again. You are so sweet, Vanessa! The creativity of this dish comes from Lauren Ulm of Vegan Yum Yum…I just tweaked it a bit. But, it’s totally an awesome fall pasta dish. Thank you so much!! Definitely let me know next time you are in the area and we’ll do it again. And this time actually take a photo to document it!! Pasta is always a winner at my house! I love the fall twist! I love spinach and I love pasta! That sauce sounds so good too, anything with pumpkin and maple is so delicious! I agree. The fall flavors are so good! Thanks, Brandi! What a great flavor combination. I’ve never put dried cranberries in pasta, but I like the idea. I owe the inspiration all to Lauren Ulm. I really wish she was still blogging. I think you’ll love this, Linda! 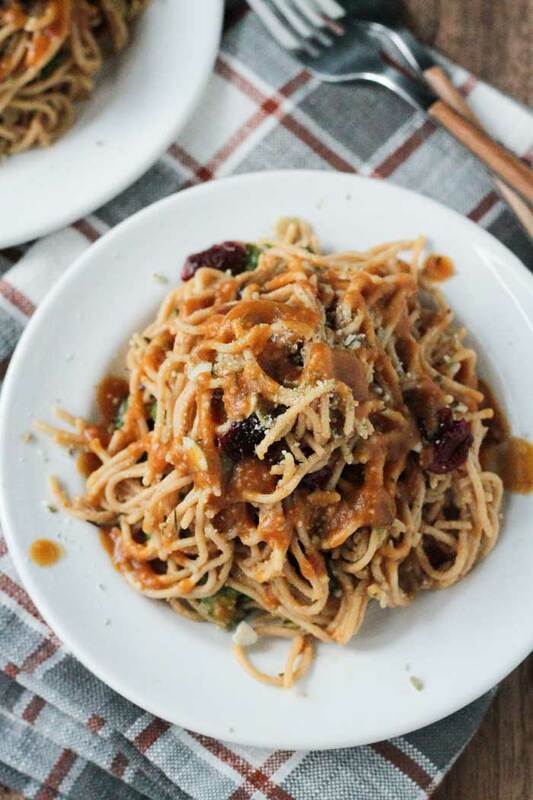 I love this autumnal twist on classic spaghetti! Thanks! It’s a great combo! What a fun spin on pasta! I fondly remember Vegan Yum Yum from back in the day. So many blogs have come and go over the years. I know, it’s so sad. I truly loved everything of hers and it’s one of my favorite cookbooks that I still use all the time. 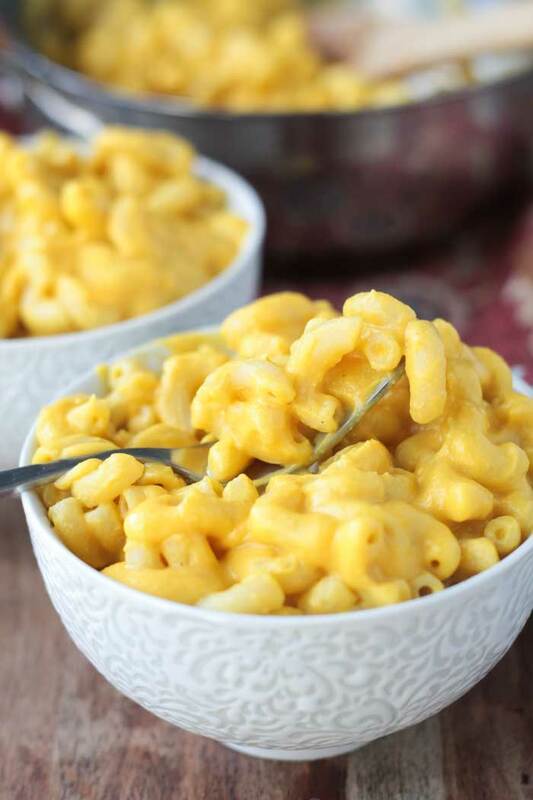 Fall is my favorite time of year – for weather and food! Loving this combination of sweet and savory. I think my family would really dig this pasta.